“We can’t do the same to Venezuela!” the organization said. The U.S. is backing self-declared interim president Juan Guaido and imposing economic sanctions. The Trump administration has also warned that “all options are on the table” in terms of Venezuela. Seeing echoes of the lead-up to the Iraq war, Brazilian activist Maria Luísa Mendonça toldDemocracy Now! Wednesday, “it’s important to have resistance” to intervention in Venezuela. The 2003 invasion of Iraq became an ongoing war that has directly or indirectly killedhundreds of thousands of Iraqis—though by some estimates the death toll stands at over one million. U.S. forces have also been accused of carrying out war crimes and other human rights violations in Iraq. And while U.S. Army whistleblower Chelsea Manning spenttime in jail for exposing some of those crimes, architects and cheerleaders of the war have been given platforms at high profile universities, in corporate media, and within the Trump administration. A pro-government supporter wears a T-Shirt with image of Venezuela’s late President Hugo Chavez, as he waits for results during congressional elections in Caracas, Venezuela, Sunday, Dec. 6, 2015. The illegitimate, Venezuelan “ambassador” to the United States appointed by coup leader Juan Guaidó attempted to hold a press conference March 19 announcing that he had seized control of diplomatic compounds in the United States. But activists from the ANSWER Coalition and Code Pink were there to expose this illegal act against the sovereignty of the Venezuelan people. In Caracas, Gloria La Riva of Liberation News interviews Rafael Argotti, a university professor and member of the Bolivarian Movement of Engineers and Technologists. Despite the massive blackout, masses of Venezuelans continue to mobilize — with big rallies and with grassroots organization to distribute water and food. CARACAS, VENEZUELA — For nearly four days, much of Venezuela has been without power, bringing the country’s embattled economy to a near standstill. Though power is now returning, the outage saw U.S. officials and politicians blame the Venezuelan government for the crisis while officials in Caracas accused the U.S. of conducting “sabotage” and launching cyberattacks that targeted its civilian power grid as well as of employing saboteurs within Venezuela. Posted in USA, VenezuelaComments Off on “Lights Out!” Did Trump and His Neocons Recycle Bush-Era Plan to Knock Out Venezuela’s Power Grid? Venezuela’s self-declared interim leader Juan Guaido, center, greets supporters after a rally at a public plaza in Las Mercedes neighborhood of Caracas, Venezuela, Jan. 26, 2019. Fernando Llano | AP. Posted on 13 March 2019. Tags: Venezuela Opposition ? While independent outlets have made headway in challenging government narratives, such outlets are often maligned by influential mainstream outlets for reports that question the official story — at least until the MSM decides to get on board and question that story themselves. CARACAS, VENEZUELA — The international outrage generated by images of U.S.-donated “humanitarian” aid on fire at a Colombian-Venezuelan border crossing last month inspired a frenzied call for Venezuelan regime change from top U.S. politicians and media outlets once the blaze was promptly blamed on the Venezuelan government led by President Nicolás Maduro. Many independent journalists and non-mainstream outlets had been more skeptical, while still others provided video evidence that — in fact — Venezuelan opposition protesters, not the Venezuelan military, had been responsible for the fires. Yet, this evidence was ignored by the corporate media, and those opposing the official narrative became “Maduro apologists” in a narrative all too familiar to those who remember previous U.S.-led regime-change efforts abroad. Now, several weeks later, the narrative has suddenly reversed, following a New York Times investigation that revealed that the fire that consumed the aid trucks had indeed been caused “accidentally” by members of the Venezuelan opposition. The Times published on Sunday a report that corroborates earlier reports from independent journalists that a Molotov cocktail thrown by a supporter of the U.S.-backed and -funded opposition was ultimately responsible for the blaze. It is unclear exactly why the Times decided to publish this story now, given that footage available over two weeks ago shows the Molotov cocktails being thrown at the aid trucks and the burning rag landing atop one of them. However, the Times’ report is a rare example of a mainstream U.S. outlet challenging the official narrative about a government currently being targeted by Washington for regime change. Despite the fact that claims that Maduro was responsible for the incident have been debunked by the country’s “paper of record,” the U.S. government has declined to walk back from the narrative entirely, though it has notably struck a more “cautious” tone. Marquis failed to explain how hurling Molotov cocktails qualified as “safeguarding” aid supplies. The Times notably accords these statements considerable credibility, despite the fact that the core claim of the article — that the Venezuelan opposition was responsible for the fire — should greatly reduce their credibility regarding this incident. For instance, after Marquis stated that “Maduro is responsible for creating the conditions of violence,” the Times wrote that “the aid shipment created a showdown unlike any on the border between Colombia and Venezuela in years” and proceeded to bolster Marquis’ claims that Maduro was responsible for the border showdown. In addition, the Times entertained claims made by Gaby Arellano, a spokeswoman for the U.S.-backed Venezuelan “president,” Juan Guaidó, who asserted that tear gas canisters thrown by Venezuelan forces were to blame for the fire, despite the fact that tear gas is not incendiary, unlike Molotov cocktails. The Times article ends with a quote from Arellano, stating that the proof that Maduro’s government is responsible is that “it was all recorded live by the media. There’s even videos where you can see it all happening,” even though the ostensible crux of the story is that those very videos show the opposition to have been responsible. It seems likely that the Times gave so much attention to these statements and counter-narratives to prevent itself from straying too far from the official narrative, even to the point that it calls the core thesis of its own report into question. Indeed, the Times has long been a cheerleader of past government lies that were used to manufacture consent for war, including the “weapons of mass destruction” lie that led to the Iraq War. Thus, this latest report is refreshing in the sense that the Times was willing to challenge the prevailing narrative, even if it sought to weaken that challenge as its report went on. Yet, the Times report also shows the power of such top media outlets in controlling the narrative. While independent outlets have made headway in challenging government narratives, such outlets are often maligned by influential mainstream outlets for reports that question the official story. Yet, as was the case here, when a newspaper like the Times later corroborates those independent reports, it becomes an accepted fact and the narrative changes. If anything, this particular incident shows not only the importance of independent media outlets but the continued role of the top media outlets in determining the course of public opinion, particularly in regard to Washington-brokered regime-change operations abroad. This is not the first time our government and our media have conspired to drag the American people into war with another country—or helped create a coup that will inevitably have disastrous results. Iwas 23 when we invaded Iraq, and I wasn’t sure it was based on lies, but something deep down in me—just behind the spleen—told me it was based on lies. Kinda like if your blind date shows up and you notice he has a 2004 flip phone. It seems vaguely worrisome, and no explanation he can haltingly supply will put you at ease. Plus, anyone else who acts like it’s normal also becomes suspect. Over a dozen progressive House Democrats on Thursday condemned the Trump administration’s “unacceptable” push for regime change in Venezuela. 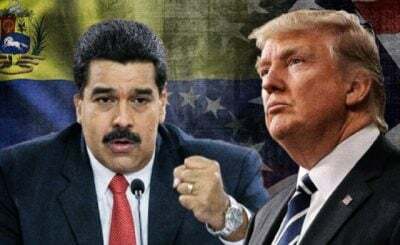 “President Donald Trump and other senior United States (U.S.) officials have generated alarm in Venezuela and throughout the region with actions and statements—such as the recent threat that ‘all options are on the table’—which indicate a pursuit of American military-led regime change,” reads the letter. —Rep. Ro KhannaThe progressives also slammed the Trump White House for “crippling” millions of ordinary Venezuelans with unilateral sanctions. “[T]he president’s recent economic sanctions threaten to exacerbate the country’s grave economic crisis, causing immense suffering for the most vulnerable in society who bear no responsibility for the situation in the country,” the letter states. The progressives’ letter comes as Vice President Mike Pence and national security adviser John Bolton continue to lob threats at Venezuela’s elected President Nicolás Maduro. In an interview with Telemundo Wednesday night, Pence reiterated the White House’s support for Venezuelan opposition leader Juan Guaido, but said there is “no timeline” on the U.S. push for regime change. Trump’s Venezuela envoy Elliott Abrams—whose role in U.S.-backed massacres and genocide and Latin America during the 1980s has come under scrutiny since his appointment in January—said during a Senate subcommittee hearing on Thursday that the administration is planning to “expand the net” of sanctions against Venezuelan institutions. While condemning the Maduro government for violence against protestors and “disregard of the rule of law,” House progressives said the Trump administration’s meddling is “making life worse for ordinary Venezuelans” and urged the White House to support peaceful negotiations.